Girls for HIS Glory: Christmas Recap! I pray this finds you well and WARM today as we are getting SNOW in Cleveland, TN! Yay! I hope enough falls to actually make it fun. I decided to wait until next Wednesday to post January's DIG Questions so that I can promote it better at youth group. So be on the look out next week! In the meantime, I thought I would share with you some highlights of what the Girls Ministry did before Christmas and a little about my trip home. All the pictures are from my phone, so they are a little grainy...but! you can click on each picture for a larger view too! 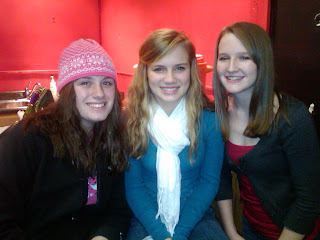 We had our last High School Sunday Night Makeover for 2009 on December 6th! It was so much fun! Mrs. Debbie Creech had quite the spread of treats and snacks prepared for us and did an awesome job leading a great discussion on "Mean Girls." She talked about how we are to live for Christ and seek to include others instead excluding them. She also gave some advice on what to do when we have a mean girl in our life. In short: Pray for them! Know too that your worth is in Christ and not in the opinions of those that are insecure. Mrs. Gina Allison also gave a convicting scenario which charged us to hold our friends accountable to godliness, even if it means they choose not to be our friend anymore for our boldness to confront in love. 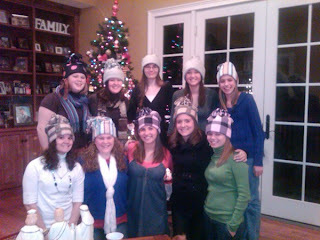 We concluded the night by making uber cute winter hats and then all attended our church's Christmas Concert together. 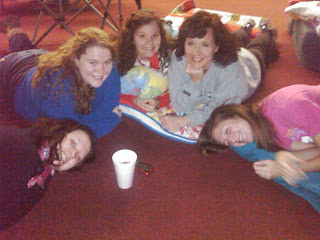 The last day of finals and first evening of Christmas break, we had a Movie and Chili Night for the High School students. We were supposed to have a huge bonfire but had to move it inside due to the torrential rain that fell all day long. Some of our youth moms/Sunday School teachers made some homemade chili and we watched "Elf". I don't think their could have been anything more perfect to do on such an icky night! Here's some pictures of some of the girls that joined us. Many of our Sunday School classes also helped bless the families we adopted for Thanksgiving and Christmas. They provided food and many items from their "Christmas Wish List" to spread the cheer and thanksgiving of Christ during the holiday season. 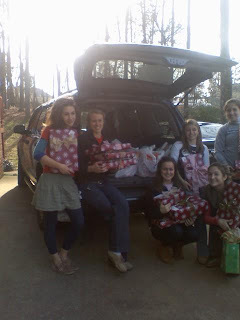 Here's a mobile-pic of Mrs. Renee Curry's 11:00 Junior Girls Sunday School class as they load up to take presents and treats to a local family. 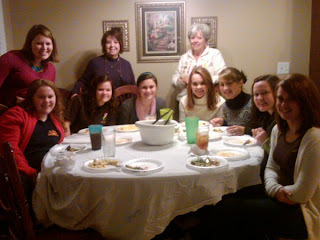 T he Senior Girls also got together for a night of fellowship, gift exchange and dinner! Yes, THE GIRLS cooked and it was delish! I was honored to be invited and take part in the festivities with such fun girls! 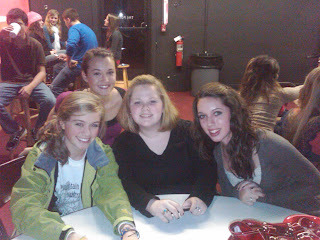 I can't believe I have only one semester left with them! Tears! On a personal note, I had SUCH a sweet time at home this year. It was a refreshing retreat and fellowship time with my family. We have TWO additional babies in our family this year so it was especially a precious time for me to spend with them since I don't get to see them growing up on a consistent basis. Jackson, one of my nephews, is almost FOUR now!! I cannot believe it! He is at a really fun age now and I really enjoyed my time with him. 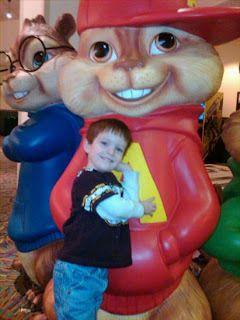 We even had an "Aunt Suzanne and Jackson" day where I took him for ice cream and a movie and then we did other fun games together that evening! 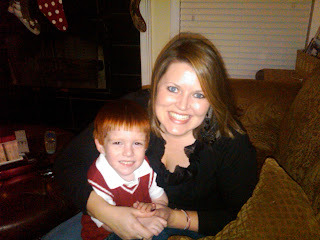 He is such a ham and a joy to spend time with! How was YOUR Christmas?? Comment below and let me know! Wow! 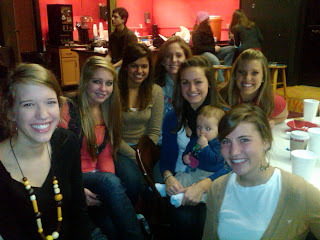 Such a busy fun time in the Girls Ministry and 2010 has many exciting adventures ahead! I have been praying feverishly over this new year and I am pumped about what the Lord has planned for this ministry! Middle School Girls: THIS Monday Night (Jan. 11) we will have our first Monday Night Makeover of 2010! We will meet at Mrs. Candy Clark's home from 6:30-8:00. You don't want to miss this! E-mail me if you have questions....see you there!